We were intrigued by the décor of 55 Steamboat during our search for a new steamboat place. 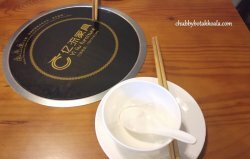 As we tried to fit it within a certain budget, we have to exclude those high-end steamboat place. 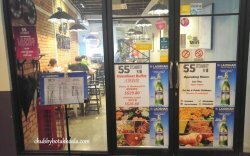 While most steamboat restaurant is decorated in a traditional way, 55 Steamboat décor is catchy with cafe like modern industrial setting. Price quoted for weekend dinner is $29.80+, which is reasonable. Though price quoted is for buffet, they apparently still charged for the soup base. The options for the soup base are Tomato Soup, Bone Soup and Hot & Spicy Soup. We decided on Tomato Soup and Bone Soup ($18 for double soup) combination. The tomato soup base turns out to be the right pick. It robust, refreshing, filled with the flavour sweet and tanginess of tomatoes. 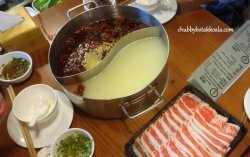 The bone soup looks like it has been boiled over a long period, essence from the bones was extracted into the soup base. Our friends that ordered the Hot & Spicy soup, gave their approval on the level of spiciness in it. There are about 50 items you can choose from ranging from meat, poultry, seafood, premium fish balls and vegetables. Check out the picture for the full menu. The sauces are sesame, chilli paste, mala (oily, numbing & spicy), satay and other regular offerings. For the meat range, sliced beef, sliced mutton and sliced pork belly are the must order. 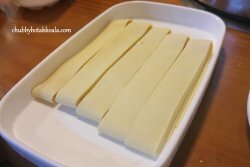 They are thinly sliced and cook within a few seconds. Due to the reasonable fat content, the meat is succulent. The sliced lamb has a bit of the gamy taste, similar to those in China style of steamboat. The marinated beef is something that you must order. 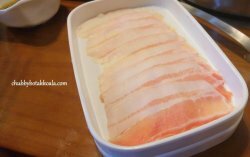 The cut is slightly thicker but remain tender and tasty without any sauce. Another must try here are their balls. The fishball with fish roe, sea urchin balls, and salmon ball with cheese are not only unique but it is addictive as well. 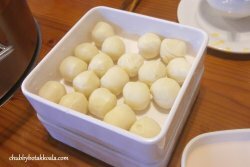 We like the fishballs with fish roe as it has the crunchiness in its fillings, while the sea urchin balls tasted like custard fillings. It is sure interesting. If you are looking for something more exquisite, there are duck tongues and pig brain. 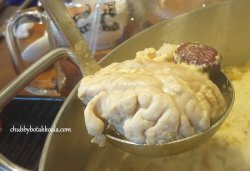 The pig brain is ala carte, priced at $5. 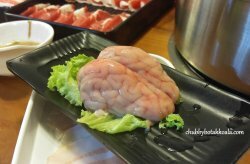 For me, the pig brain is more like conquering your Fear Factors experience. Cooked for about 10 to 15 mins, it shrinks to about two third of its raw size. 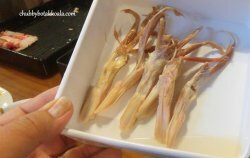 It does not have any foul smell or taste, instead, it is soft and mushy, like bone marrow. Interesting, but not going to order it ever again. For veggies and beancurd, I like their frozen bean curd, bean curd skin and fried bean curd. Nothing fancy about them but it just some comforting selections for my steamboat. The price for the drinks is reasonable, so nothing to compare about. 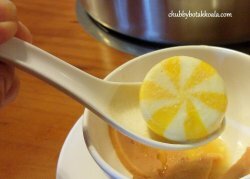 To cool down the heat after the steamboat, check out their selection of ice creams which is part of the buffet. They have 6 flavours and all tasted good, especially the Thai Milk Tea flavour. All of the service staff during our visit is mostly young adults. Like students doing it for part time work. Definitely making the environment trendy and more cafe like. Dining in 55 Steamboat is like having steamboat in a trendy environment. The food is good and the price is reasonable. We'll definitely come back for more in the future but definitely, won't order the Pig Brain. Check out their Facebook page for their Monthly Promotion. Cheers! !